Linda was a pleasure to have as our celebrant, and a very calming influence, even forgiving me for missing her appointment. Her understanding and thoughtfulness along with attention to detail helped us get on with the job of getting hitched without having to worry about the proceedings and how the ceremony would flow. Read more about Craig & Carita’s wedding on Polka Dot Bride. We still get comments that it was the best wedding people had ever attended. A gentle soul. 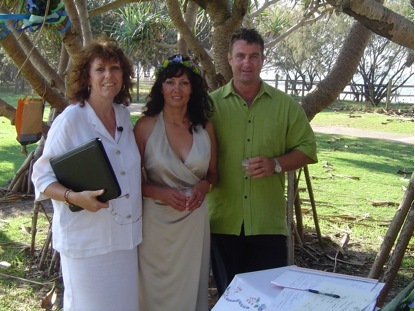 Linda married Gilles and I in September, we had a very simple ceremony on the beach at Peregian. As the sunset Hari conducted our ceremony to the sounds of the didgeridoo, Gilles and I wanted a spiritual and nature based ceremony and this is what Linda provided. Her gentle nature and softness was perfect, she spoke clearly and calmly and the message we wanted to purvey glided off her lips like music. She bought all the guests together and we felt such an intense unity as we said our I do’s. We still get comments that it was the best wedding people had ever attended. Linda is lovely lady, a gentle soul with all the right stuff both inside and out!! So thank you Linda for a really memorable day and I hope you continue to do your work and bring such happiness to many more. We found Linda to be a very sweet, engaging lady that made us feel completely relaxed during our wedding ceremony. We would highly recommend her to anyone that is looking for a lovely, respectful, kind hearted marriage celebrant. We had a fantastic wedding day out on the sand island, we thoroughly enjoyed every minute of it. We want to thank you very much for making the ceremony so touching and personal to us. 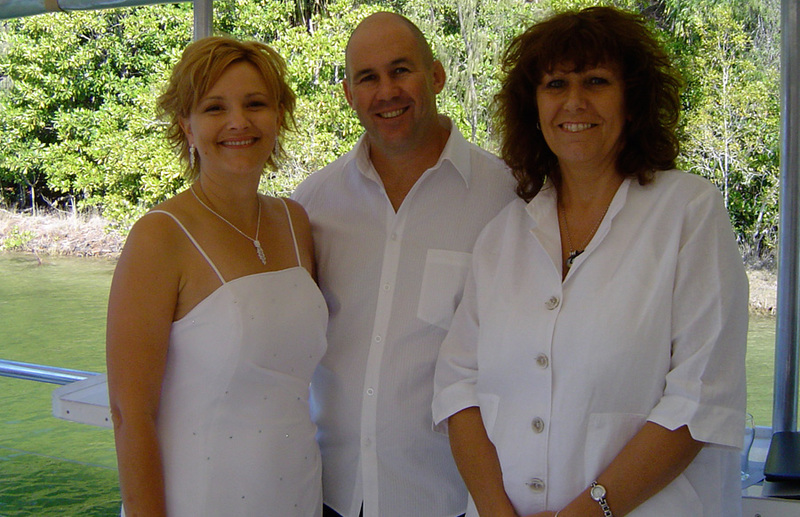 Your services as a celebrant certainly exceeded our expectations from the preparations through to the big day. You made such a special time relaxing and enjoyable, allowing us to have as much input as we liked in to our ceremony and helping us to choose our vows. Thank you once again for making our wedding day exceptional. Of course you can use a picture of us for your web site. Thank you so much for sharing our special day. You certainly made it easy for both Beau and I. From the beginning you have been very helpful, your advice and input has been so valuable. All the information you provided us with for writing our vows and what not, you are amazing! You really made it a memorable experience for us Hari. Our ceremony was perfect, you did a great job of getting everyone together and making Beau and I feel at ease throughout the whole event. So many of our guests commented on how fantastic you were, It was really great to have someone we felt so comfortable with. You obviously enjoy what you do. It was a pleasure and I would most certainly recommend you to any other couple wanting your service. We will cal you for the naming of our children. Thank you so much for helping create the most beautiful ceremony for us. Everything was just perfect,The ceremony had everything we had hoped for…laughter, tears and most of all love. We could not have wished for better! Our friends and family are still commenting on how lovely they all thought you were and how great out ceremony was. Your calm and loving nature made us both feel very relaxed which made it easier fo us to really absorb the moment. Thank you once again. With Love. Garth and Bianca Cochrane. guiding us through the entire wedding ceremony with professionalism and charm. We would recommend her to anyone including my sister, whom I hope will enlist her services next year. Thank you so much, the ceremony you created for us was incredibly beautiful… from our initial meeting we both felt so comfortable with you and you smoothed out all our little worries. We could not have asked for a better celebrant than yourself! I would have no hesitation in recommending Linda, she came highly recommend to me and I wasn’t disappointed. I found her to be considerate to our needs and I greatly appreciated her compassion in our time of loss. I mentioned that I wanted a service on the Noosa River and Linda was able to recommend a secluded spot which was perfect for our special celebration of Isabelle’s life. Linda is professional in her approach and shows great sensitivity which was demonstrated by the beautiful tribute that she created for my wife. Our ceremony was very special, when Chinta looked into your eyes they were full of sincerity and gentleness, courage and strength, which Chinta and I appreciated and which helped make the moment even more special. in our opinion you gave an impeccable delivery with genuine love and meaning for which we thank you. In addition it happened in delightful surroundings amongst really good friends. We would like to thank you very warmly for organising and delivering the ceremony so beautifully. I wish I could have our wedding day over again. Linda, you did the best job ever, you really did make our wedding day special. You are very loving and that is reflected in your service. I enjoyed our meetings before the wedding day, they were relaxed and happy. I wish I could have our wedding day over again. Thanks for such a great ceremony and I will recommend you to all our friends. Thank you Linda you made our special time even more special. It was a very happy and relaxed time and we hope we see you again one day. We will stay in touch when ever we come back to Noosa. Choosing Linda to be our celebrant was the best decision we’ve ever made. We basically handled everything ourselves from beginning to end but it was the suggestions made (including the very important one – ‘relax!’), the guidance given and the beautifully delivered, harmonious ceremony that Linda helped to create for us that is the reason we both look back with complete happiness and an enviable ‘we wouldn’t have changed a thing’ feeling in our hearts. 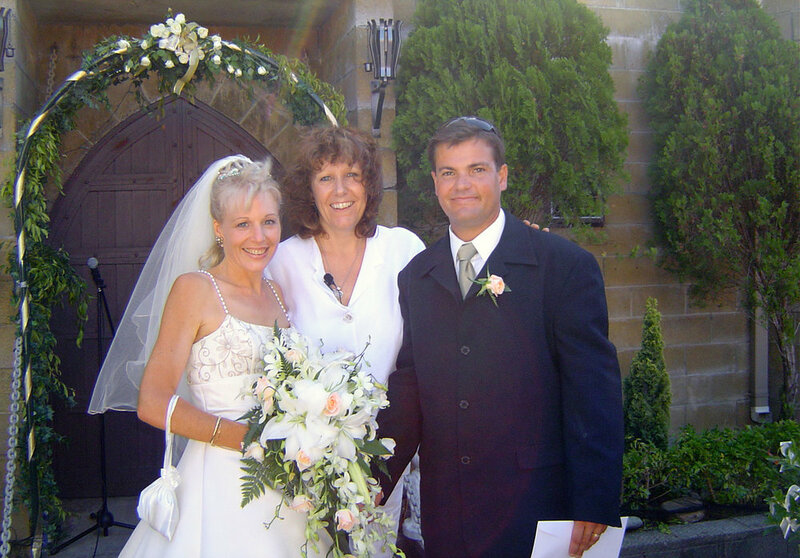 Linda supplies the right amount of professionalism, experience, spirituality and calm required by any couple approaching their most important of days and next to deciding to be with one another for life, choosing Linda to be our celebrant was the best decision we’ve ever made. Linda thank you for being our celebrant! We appreciated the guidance and information you gave us to plan our wedding. Your approach was both friendly and professional. Your confidence throughout put us at ease so that our day ran smoothly and the wedding was really fantastic! We cannot thank you enough for your care and contribution. Our day was all the more special for having you there. 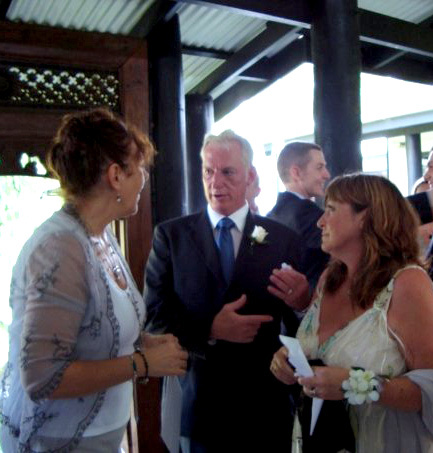 We thought all wedding ceremonies were pretty much the same until we met with Linda and she explained all of the personal aspects which could be incorporated into our ceremony. I am not a particularly religious person and it was good to meet with someone who understood our thoughts and beliefs in this regard. Our ceremony was very personal, meaningful and exactly as we wanted it to be. We would strongly recommend Linda to anyone. Thank you for being our Marriage Celebrant and for the lovely, heartfelt ceremony. We are very happy. We wanted to thank you again for the beautiful ceremony you lead us through last Friday. It was beyond magical… and like everything beautiful for me it goes too far… I’m glad I took my time to walk the trail and took it all in as much details as possible. A heartfelt thanks to you for making our wedding a magical day we will always remember. We enjoyed the whole ceremony because it was so magical. Our ceremony was delivered sincerely and professionally. We were more than happy with you and your service. Linda, we put you in a difficult position, the wedding being a secret and all, but everything went off perfectly, you were fabulous! Linda is the perfect wedding celebrant. Everything went totally as planned, Linda made us feel very comfortable and everybody at the wedding thoroughly enjoyed the service. Linda’s manner and presentation showed warmth and sincerity. We would recommend Linda to all. Our wedding ceremony went exactly the way we wanted it to go. Whilst Linda gave us her input and suggestions, she listened to us and put the ceremony together exactly as we hoped. I particularly liked the quiet time given to thoughts on departed loved ones. I would describe our ceremony as relaxed, fun, loving and perfect. Thank you so much for making our wedding day so special, personal and touching. We both enjoyed every second. We had many guests comment on how beautiful our ceremony was. Thank you. Hi Linda, Thank you so much for your guidance and love on the day. You made it very special for us all and you felt like a part of the family, your service was warm and friendly, we would recommend you to anybody. Wedding organisation can be hectic and all consuming! 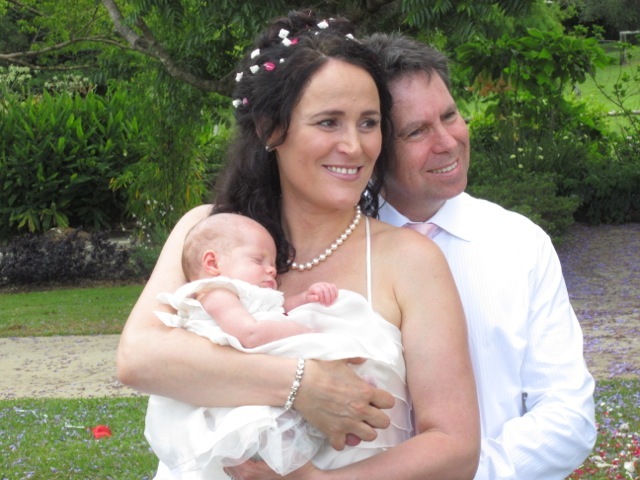 Choosing Linda as our celebrant was one of the best things we did! Working together with Linda proved relaxing and fun … just what we wanted and received for our ceremony too. 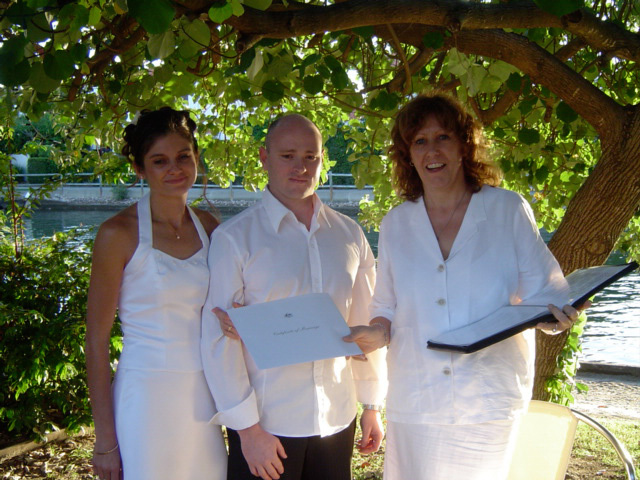 Our whole experience of meeting in person at Linda’s house to receive suggestions and input via email and phone, our wedding day, name change documentation and all the extras Linda gives, made our ceremony and wedding all the more special. Not only did I gain a husband but we feel we also made a friend. How can I ever thank you! You made that day the best day of our life! Even though I wasn’t feeling well everything went to plan. The ceremony reflected the relaxed and intimate wedding we had hoped for. Linda you were fantastic. You were the perfect down to earth person for our celebrant, you felt more like having a friend or family member at our wedding. We felt comfortable talking to you from the time we met you. Your suggestions for ceremony locations helped us decide on Noosa Sound Park. Lots of people positively commented about the location and it looked great in the photos – so I would highly recommend it as a nice shady park for a summer ceremony. Linda, we would like to thank you for all your help leading up to our wedding and for creating such a beautiful ceremony. We knew next to nothing about wedding ceremonies and you guided us every step of the way. Your suggestions and ideas were fresh and original and you helped us to get exactly the type of ceremony we wanted. We wanted a short simple ceremony, but one with warmth and feeling. Thanks to your help, this is what we got – many people commented how lovely it was. We couldn’t have asked for anyone more special person to conduct our wedding ceremony. Thank you so much Linda, it was such a wonderful day. You helped to make it all happen – beautifully! Hari…just a quick note to again say thank you! You helped to make it all happen – beautifully! It was obvious to both of us that you really put your heart and soul into our ceremony – it really meant something to you to be involved, and that kind of honest sympathetic joy is rare in any occupation. We felt guided to you, and blessed with your involvement. We will definitely drop in and say Hi the next chance we get to visit Fiona and John at Eumundi. We wish and hope for you a long and joy-filled life – much love and gratitude. I just had to write you, and thank you so much for a very beautiful day. It was more than I expected and I can’t honestly remember laughing and smiling so much for a real long time, it was as though a magic wand was waved. You, I think have a special gift … for making people feel at ease, to be natural and just enjoy the moment, you’re a special lady indeed and I’m thankful we got you as our celebrant. Keep on doing what you do … that’s making souls like myself very happy. Many, many thanks for your guidance support and professionalism on Saturday, many guests commented on what a great ceremony you conducted. It really was a wonderful ceremony and your calming nature was of great benefit to both of us. The way in which you gently guided, directed and prompted us all throughout the ceremony was fantastic. 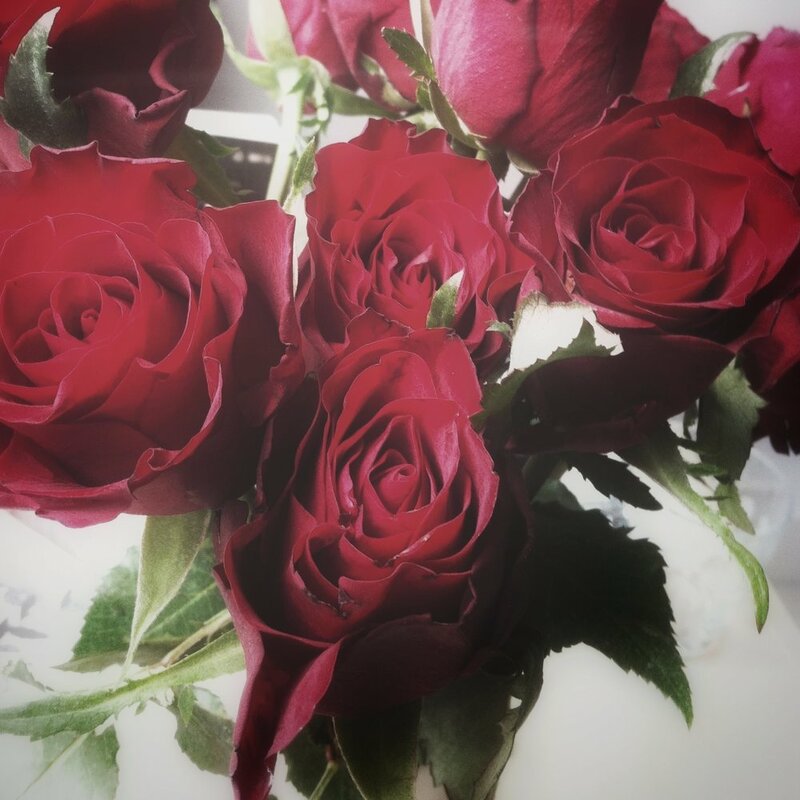 Thank you once again – we really couldn’t have wished for a better celebrant. We want to thank you so much for marrying us. The person you are made it more special for us, your voice, smile and energy will always be remembered. May life be kind to you and we hope to bump into you again. Linda, we were delighted at how our wedding day turned out and with your contribution to it. 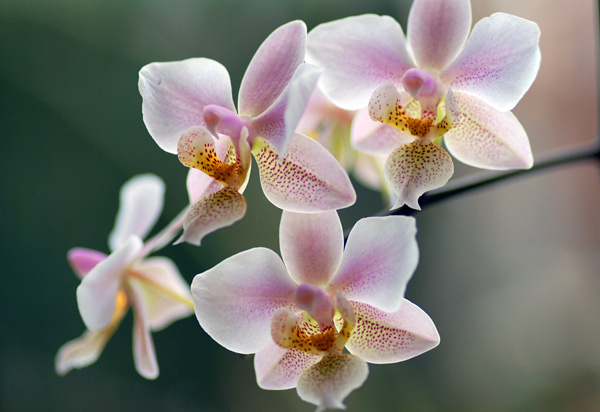 Your wonderful words and warm, calming presence added to making our day very special indeed. Thank you. Not only were we blessed on the birth of our beautiful little girl Shamia, but we were also blessed to have Linda do our Naming Day. Such attention to detail, not leaving anything out. Her beauty truly shines from within. The extra special personal touches, like the Wishing Box and certain wordings were truly memorable. We were determined to have it on the beach even though the weather was not the best, and nothing was a problem for Linda even when it started to rain. Her gentle, caring and spiritual touch was one all our family and friends will carry with them always. It was a wonderful wedding and we thank you from the bottom of our heart for helping us put it all together and being there in your wonderful presence, it was a honour to have you as our celebrant, and it was just beautiful. I would like to see you someday and show you some photos and just to reconnect as you are so special. It was an amazing new beginning for Gary and myself, on our path as we grow and move forward together. Our day for Huie went off beautifully, everyone was relaxed and thoroughly enjoyed the ceremony, especially the candle lighting. You gave us exactly the occasion we wanted to welcome Huie into our circle of friends and family. We would recommend your services to anyone. Our ceremony was magical, perfect and memorable. We have no hesitation in recommending Hari as a celebrant. Thank you for making our special day at the Castle, a fairy tale wedding! With your personal, professional service. Our wedding ceremony was relaxed, romantic and peaceful and simply beautiful. Thanks to you. It was a honour to have you as our celebrant. I highly recommend your service to anyone wanting a personal and special celebration. I want to express how grateful I am to have had Linda’s support during my mum’s passing. The funeral service she carried out was one that will stay in many people’s minds and hearts forever. The energy, effort and detail Linda put into the service and the day was exceptional. Linda helped create the nicest possible way to remember my mum’s life. I’m sure my mother Iris was glad to have Linda as her celebrant as was I. Thank you Linda. As soon as I met Linda I knew she was the perfect person to deliver a special service for my father. Linda has such a warm smile and gentle nature about her which made me feel totally comfortable and at ease during the process of organising the service. Linda delivered a truly heart felt and compassionate service, it flowed beautifully and will definitely leave lasting memories of my father. Thank you Linda from the bottom of my heart. Linda conducted a beautiful memorial service for my mother. 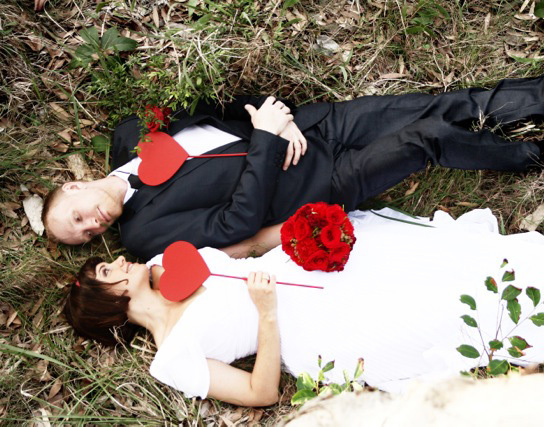 She carefully sought our requirements – particularly the philosophical flavor of the ceremony. She provided lots of appropriate material from which we chose pieces to include. She conducted the ceremony with dignity and sensitivity. All present agreed that it was a very special service and a fitting memorial for the person concerned. I would highly recommend Linda as being very caring, competent, conscientious and professional in her work. We were so blessed to have had you. The attention to detail was so very special from the first day that you came down and sat with dad and I to the actual service it was just beautiful. Speaking for not only myself but my entire family you did an amazing job, and I know mum would have been so very happy. Your gentle and loving nature was incredibly warming to all of us and we new that all would be taken care of .Mum is with us all in many ways and her spirit and unconditional love lives with us all and will continue to shine. Grace and gratitude goes out to you, thank you for listening and being there for us. We are blessed to have had you and are forever grateful . Kind regards and soulful love.